I was out taking a walk, and these gorgeous Italians called out to me. I couldn’t resist. So I brought them home and we made dinner…. In case that all sounds a little racy to you, I would like to make it clear that these are Italian Eggplants I am referring to. Deep purple, shiny, and a lot smaller than the traditional supermarket variety- but what to make? 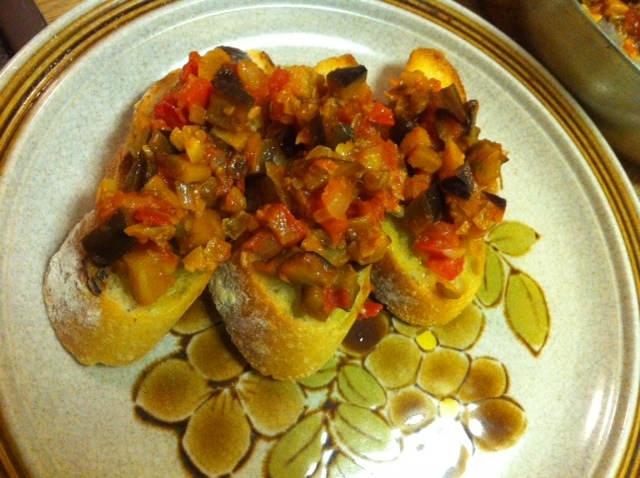 The answer, my friends, is caponata, a tangy, slightly sweet chilled hodge-podge of tomatoes, raisins, capers, eggplant, and olive. Perfect for a hot humid summer day. Cook it as far in advance as you want, and let it cool and combine at least for a few hours. Salt the slices of eggplant first to remove some of the excess water, and place them on top of paper towels or in a colander. Also, instead of soaking the raisins in water, I chopped them up along with the capers, vinegar, and olives and let that marinate for a while so they picked up the salty brine. Olives, Raisins, Vinegar, and Capers. Saute onion until translucent, then add the garlic and tomato paste. 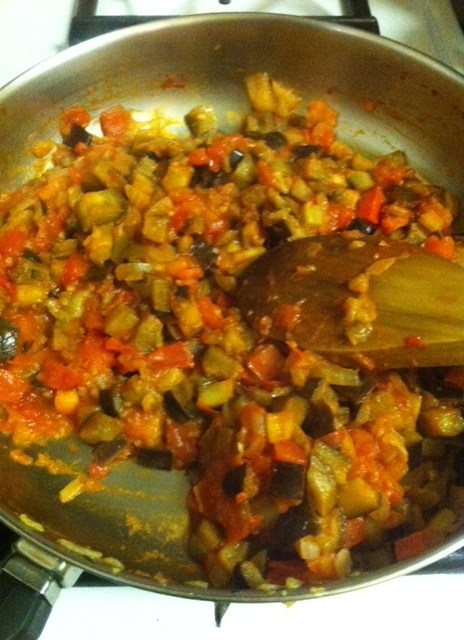 Stir to combine, reduce heat to medium low, and then add the eggplant. 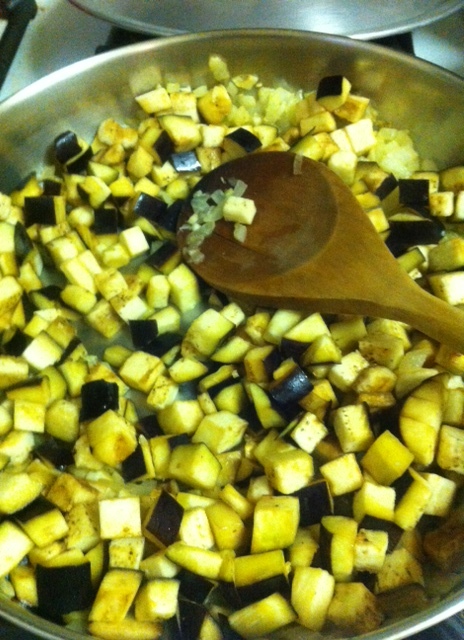 Stir constantly and cook for an additional 4-5 minutes, until eggplant is becoming very tender but not mushy. 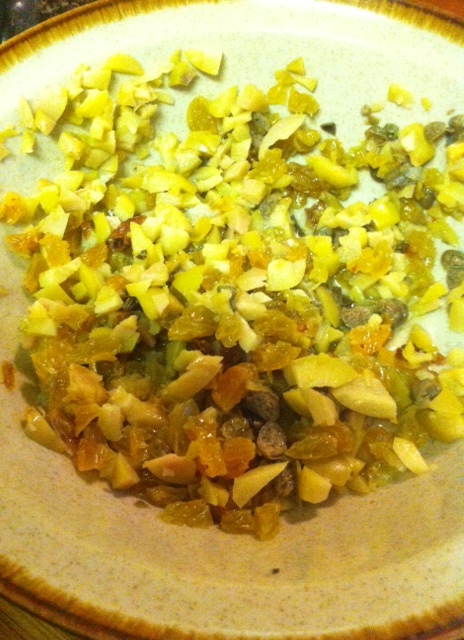 Add the raisin/caper/vinegar/olive mix and tomatoes last, stir, and reduce heat to low. Season with salt and pepper to taste, then cover and let simmer for at least 5-6 minutes longer. Let cool, and serve on top of lightly toasted baguette or pane de casa brushed with olive oil. Enjoy!